This week's showcase homes starts with this beautiful hillside estate in Orfange, CA. 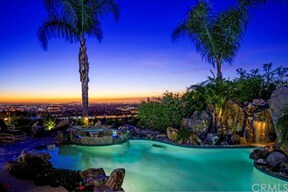 One of a kind estate offering 180 degree panoramic views of city lights toward Catalina! End of cul-de-sac location, gated community offers an added layer of seclusion. Blending luxury with the practical, this spacious home offers a foyer with soaring ceilings flanked by a library/office with built-ins, formal living and dining room.